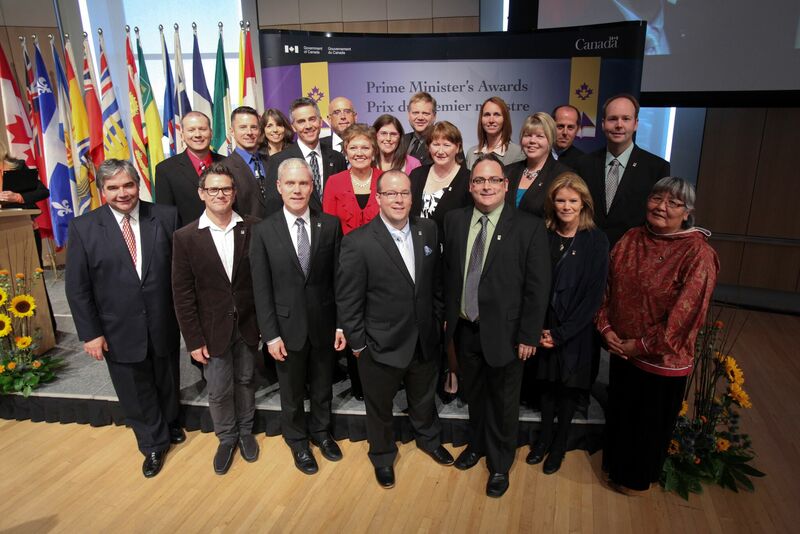 Canadian Teacher Magazine salutes the 2010 – 2011 recipients of the Prime Minister’s Awards for Teaching Excellence. These awards, conferred annually, recognize the efforts of outstanding teachers across Canada. Certificate of Excellence (national) and Certificate of Achievement (regional) levels, carry cash prizes of $5,000 and $1,000 respectively. Financial awards are issued to the recipient’s school to be spent under the recipient’s direction. Certificates of Excellence are awarded to the fifteen top-ranked nominees, with at least one award designated for each of the following regions: British Columbia, Prairies, Yukon, Northwest Territories and Nunavut, Ontario, Quebec, and Atlantic Canada. The next fifty top-ranked nominees each receive a Certificate of Achievement. Recipients receive letters and certificates, signed by the Prime Minister, as well as program pins and letterhead. Certificate of Excellence Recipients with the Honourable Peter Van Loan. British Columbia: Todd Ablett; Arlene Anderson; Laurie Cassie; William Eaton; Christine Marin; Harold Wardrop. Newfoundland and Labrador: David Gill; Corey Morgan; Catherine Downey. Ontario: Sean Clark; Shirley Dalrymple; Paul Finkelstein; Scott Masters. Alberta: Rita Gainer; David Karbashewski; Jonas Marchinko. British Columbia: Dave Coad; Debbie Darling; Michael Flynn; Kristy Kilpatrick; Susan Stenson; Bruce Tate; Edward Trovato. Manitoba: Alan Binne; Chantelle Marie Cotton; Tamara Einarson; Benoit Pellerin; Gregory Shedden; Melissa Wakeling. Newfoundland and Labrador: Yvonne Dawe; Glenn Normore; Darla O’Reilly; Sean Penney; Erin Walsh; Andrew Stickings. Ontario: John Alan Baigent; Simon Ives; Christopher King; Tanya Leary; Heidi-Ann Pöltl; Frances Por; Sam Scott; Harriet Simand; Lynn Wilkins. Quebec: Nancy Beauchemin; Judy Derick; Nathalie Deschêne; Étienne Fortin; Annie Jolicoeur; Jean-Maro Perreault; Marcy Stein; Megan Webster. Saskatchewan: Robert McLeod; Dean Vendramin.